The World’s most expensive stamp is up for sale again. The price tag is a whopping 15-20 million SEK (US$2.1-2.8 million). 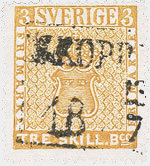 The stamp which is from 1857 was intended to be green, but turned out yellow. There is only one known copy. At the end of the 1990’s the stamp was sold for 15 million SEK to an unknown buyer. The current owner is believed to be a Swiss bank. It will be sold by the Swiss auction firm David Feldman.